New data has highlighted the alarming rate in which the world’s forests are being lost. 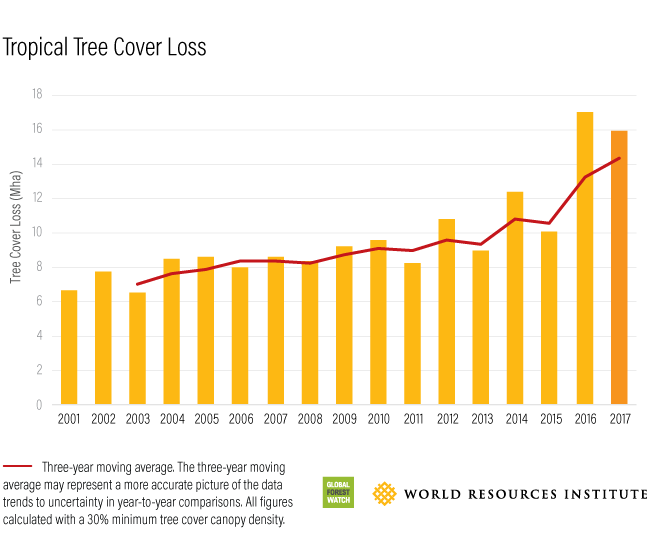 Last year alone saw 29.4 million hectares of tree cover disappear, close to the record of 29.7 million set in 2016. The data comes from the independent Global Forest Watch, part of the World Resources Institute (WRI), which analysed satellite imagery to calculate the total. Much of this deforestation is taking place in the tropics with Brazil, Colombia and the Democratic Republic of Congo, all seeing high loss rates. “Tropical forests were lost at a rate equivalent to 40 football fields per minute”, Frances Seymour, of the WRI, told a news conference in Oslo. The data is a concern as forest cover is key to combating climate change and maintaining crucial levels of biodiversity. Colombia saw a dramatic 46 percent increase over the past year, which was a by-product of the successful peace process. Significant portions of the rainforest which were previously occupied by the militant FARC group have now been opened up to commercial interests. This has led to the country’s highest court ordering the government to take urgent action to control deforestation in some of the worst-affected regions. Brazil’s rate of loss remained high despite government action and was largely the result of significant forest fires across the Amazon region. Drought in the southern Brazil and fires were caused by people clearing land for pasture of agriculture. Climate change is also increasing the likelihood of more severe droughts, which, in turn, causes more forest fires. Good news came from Indonesia which saw a 60 percent decline in loss from its virgin, or older, forests, which contain the most biodiversity. The Global Forest Watch attributed the decline to new laws, greater enforcement, and educational campaigns.